Employment Is Up In The Land Down Under! A few hours ago Australia printed its employment numbers for the month of March. The report showed the unemployment rate surprisingly dropping from an upwardly revised 6.1% to a four-month low of 5.8%. Market players had expected a 6.1% jobless rate. 18,100 workers had also found jobs for the month, which is lower than last month’s 47,300 increase but is still higher the estimated 2,500 uptick. A closer look at the data reveals that full-time employment dropped by 22,100 while part-time jobs increased by 40,200. Participation rate, the proportion of the labor force to the population, dropped to 64.7 from an upwardly revised 64.9 reading last month. What could these mean to the Australian economy? Currency traders are generally happy with these numbers. For one thing, the report is consistent with the recent strengths in business sentiment and job ads figures. This suggests that businesses are investing in the economy again despite the slowdown in the mining industry. More importantly, this could mean that weaknesses in Australia’s employment sector could peak some time in mid-2014 instead of early 2015 as the RBA had predicted. If the job numbers continue to surprise to the upside, then the RBA might consider a rate hike sooner rather than later. This would be tricky considering that the central bank wants easy monetary policy while Australia transitions from a mining-dependent to a housing construction-dependent economy. Despite this, some analysts are already predicting rate hikes as early as late 2014. Talk about optimism! Not surprisingly, the Aussie bulls were all over the pip streets during the Asian session. 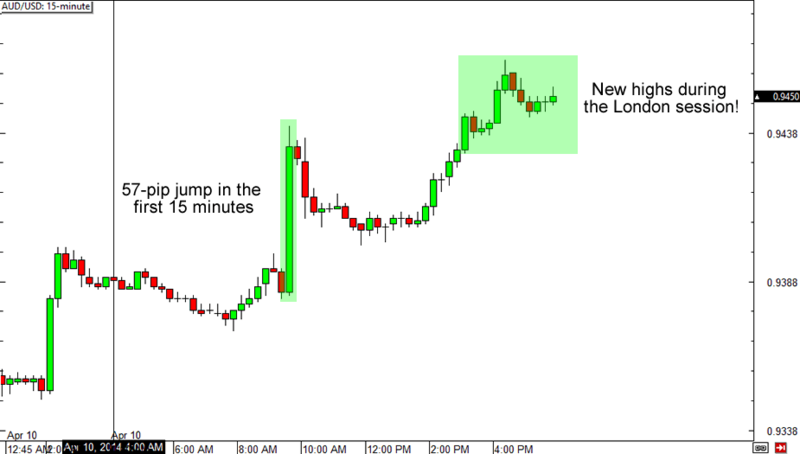 Major Aussie pairs like AUD/USD and AUD/JPY jumped by around 50 pips in the first 15 minutes of the release. Heck, AUD/USD even tipped to a four and a half-month high during the London session at the prospect of a rate hike from the RBA! Are traders getting ahead of themselves in expecting a rate hike? Word on the hood is that the RBA won’t give in to a rate hike so easily. For one thing, it’s still on a wait-and-see mode after cutting its rates left and right last year. Not only that, but the central bank would probably be careful not to significantly boost the Aussie while its economy is still making the transition out of the mining industry. What do you think? Is an RBA interest rate hike in the works this year or will the central bank hold off until 2015?